Jungle Red Writers: Have you heard about HOVER? HANK PHILLIPPI RYAN: I was thinking of all kinds of ways to introduce debut author Anne A. Wilson. I wanted the best possible hook, since I needed to let you know Anne is an amazing writer with an incredibly exciting (and inspirational) backstory and a fabulous book and…and then I thought, hey. Just show ‘em the cover. Is that not the best ever? Is that not irresistible? And it nails the story, and Anne, too. She graduated from the United States Naval Academy and served nine years active duty as a navy helicopter pilot, which included deployment to the Persian Gulf. What’s more, The Naval Helicopter Association named Anne and her crew Helicopter Aircrew of the Year, an award given for search and rescue. When I first started thinking about HOVER, I thought it must be a thriller. After all, as part of the synopsis says: A Navy SEAL Team that requests Sara as their pilot…The endgame of the SEAL’s mission is so secret, even Sara doesn’t know the reason behind her mandated participation. When Sara’s life is on the line, can she find her true self again and follow the orders of her heart before it is too late? But you know, it’s not a thriller, really. It’s women’s fiction, where the main character just happens to have a thriller-ish job. And why not? So that’s extra wonderful. Jungle Reds, here’s Anne Wilson—to tell us how it all happened! And we’re giving HOVER to one lucky commenter! Thank you, Hank and Jungle Red Writers, for graciously hosting me on your blog. 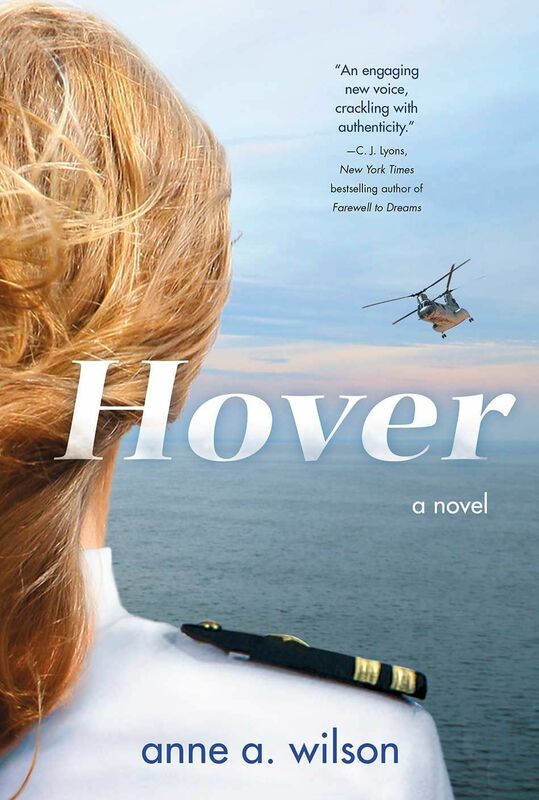 This is the launch week for my debut novel, HOVER, a story set in a U. S. Navy battle group, about a female navy helicopter pilot, who is unaware she is being groomed to fly a highly classified Navy SEAL mission. You see, I served as an active duty U. S. Navy helicopter pilot for nine years, often the only woman in a squadron, on a ship, or in a detachment. During my first deployment to the Persian Gulf in 1993, my roommate and I were the only two women on our ship, one with a crew of 500. And in our battle group, which numbered 7,000, there were just four of us. Probably no surprise that a woman making her way in a man’s world is one of the themes in my book. Readers also ask, “Are you Sara?” referring to the main protagonist. Well, I’m not exactly Sara, but you’ll find a lot of my personality in her. For example, I took great pains to avoid standing out as a woman—never wore a skirt or dress or anything remotely feminine to leave the ship on liberty. Didn’t use makeup. Hair always pulled back in a ponytail. Happy in my uniform. Gender neutral all the way. Whether this was the best approach to integrating into a such a male-dominated work environment is another thing altogether, as it didn’t necessarily allow for a healthy connection to my feminine side—something I attempt to flesh out in the novel through Sara’s character. I kept journals during my time at sea, so when I decided to write HOVER, I dug them out of boxes in the garage and combed through them for ideas. Many scenes in the book are pulled straight from them—names and any identifying details changed, of course. And because truth tends to be stranger than fiction, many of my readers guess incorrectly when considering a scene, thinking surely it was a product of my imagination, when in fact, you can find it in the pages of my journals. That time in Hong Kong? When my character Sara is standing duty as the shore patrol officer and has to mediate a dispute between a mamasan and the sailor who partook of her prostitute’s services? Yep, that really happened. In Thailand, though. And the dispute? The sailor didn’t realize, until he was in bed with the prostitute, that she was really a he, at which point, the sailor refused to pay. As shore patrol officer, you’re judge and jury for cases like this. After hearing both sides, certain services were indeed rendered, so I made him pay up. Throughout my navy career, I was privy to an endless number of sea stories, told by commanding officers, salty old chiefs, and others. But as the years ticked by, sure enough, I came away with a few of my own. Never in a million years did I think I’d be sharing my sea stories within the context of a novel, but I hope you have as much fun reading them, as I did writing them. Any questions for Anne? Are you a fan of helicopters? 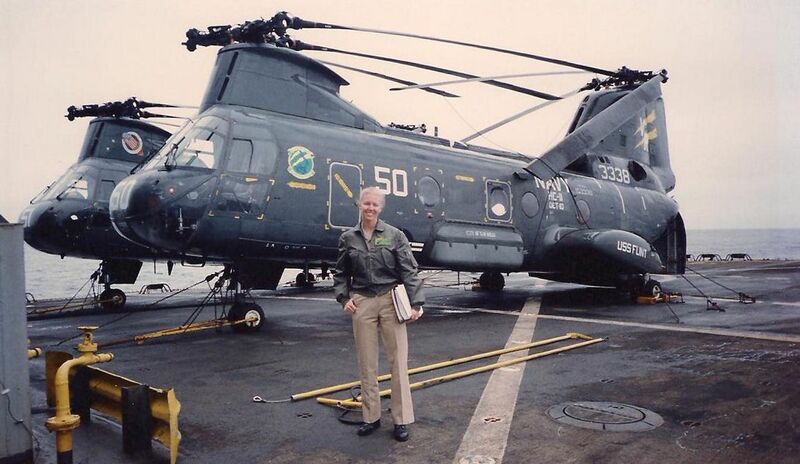 Helicopter pilot Lieutenant Sara Denning joins a US Navy battle group with little fanfare, and that’s just the way she likes it. Sara’s philosophy is simple—blend in, be competent, and above all, never do anything to stand out as a woman in a man’s world. When she meets the strong, self-assured Lieutenant Eric Marxen, those defenses start to falter. Eric coordinates flight operations for a Navy SEAL Team that requests Sara more than any other pilot. This blatant show of favoritism causes conflict with her colleagues; Sara’s sexist boss seems intent on making her life miserable, and her roommate and best friend—the only other woman on the ship—is avoiding her. It doesn’t help that Sara’s interactions with Eric leave her reeling. The endgame of the SEAL’s mission is so secret, even Sara doesn’t know the reason behind her mandated participation. When Sara’s life is on the line, can she find her true self again and follow the orders of her heart before it is too late? I've never flown in a helicopter, Hank; I think I'd like to, though. Congratulations, Anne . . . I'm really looking forward to reading your book. You say you never dreamed you'd share your sea stories in a novel, so how did you come to write "Hover?" What amazing stories, Anne. Thank you for sharing them with us. Like Joan, I've never flown in a helicopter, but I'm putting your book on my list! Wow, Ann! Fabulous cover and great back story. I look forward to reading the book, and hope we'll meet some time as I'm a neighbor in Arizona during the winter. congratulations Anne! The books sounds irresistible. How did you manage not to be terrified the whole time you served? and has there been any push back from the military about the book? I was supposed to take a helicopter ride once, then it got grounded. Don't remember if it was weather or mechanical issues. It is something I always meant to get back to. That and a ride in a hot air balloon. I should get back to that. Love the cover and congrats on the book. Wow, Anne! Your life has been interesting and it's clear your book is, too. Congratulations on publishing your debut. I will look for it. Yes, I DO love the cover. AND the title. Great hook. And what great material you've lived, Anne, for storytelling! I'm not great in the air or on water. Terra firma all the way... unless it's just too far. I admire the fearless ones but no thank you, I'll just sit here on the bench and drink my latte. Wow, what wonderful comments and questions. And thank you all for your good wishes on the launch of HOVER. I'll try to answer your questions in order. Joan, you ask how I came to write HOVER, since I never dreamed I'd share my sea stories in a novel. Great question. HOVER is actually my 5th novel. My first three were epic fantasy, and the fourth, a medical thriller. It wasn't until I finished the fourth novel that I seriously considered trying to get published. I literally googled, "How to get published," because I had but not one clue how to enter the publishing arena. In my research, I found that editors and agents wanted to know why your story was unique and why you were the one to tell it. I didn't have an answer for my first four books. It was my husband who suggested I write about my experiences in the navy and since I'm a fan of love stories, I thought, why not set my love story in a U.S. Navy battle group? That's unique and I can tell that story. Lucy, you ask how I managed not to be terrified the whole time I served and if I've gotten any push back from the military about the book. On the contrary, I have been the recipient of a flood of good wishes from my extended military family. Just beyond supportive all the way. Regarding the military as an official organization, I haven't heard anything. Really, there's nothing in the book that would reveal state secrets or threaten national security. It's benign in that way. As far as being not being terrified, I focused on my training and my procedures. Knowing those cold helped to calm the nerves. Rhys, I would love to meet you when you're in Arizona. Hallie, I will join you in that latte - a huge fan! Edith, Susan, Rhonda, and Mary, thank you for your enthusiasm about the book and offering to read it! Uggggh! Is right. I guess we never know, though, how we'll face adversity and danger until we hit it--which is why training is so important, right? I was assigned to go to Concord NH from Boston in a helicopter on the worst day ever--ever!--the day Christa McAuliffe was killed in the Challenger. I remember thinking--I'm NOT going up in that. And then I thought--I can be brave like she was brave. Anne, we've talked about thriller versus women's fiction--what "genre" were you thinking as you wrote? You've gotten fabulous and glowing reviews which describe HOVER both ways! Believe it or not, Hank, I thought I was writing a love story in a unique setting. But at the same time, this unique setting put my main protagonist, Sara, in a male-dominated work environment. This, combined with how she is dealing with the death of her brother, has lead her to shut off one whole side of herself - that feminine side. So the novel also became a story of her growth to becoming a more well-rounded woman. The thriller piece just sort of happened, because as a reader, I love suspense. I love action. I don't know that I could have imagined it without the action! This book sounds like a lot of fun. Thanks for stopping by, it's now on my to be read list. I am so excited to read this!! Anne, you confirm my choices when I made my heroine an ex-Army helo pilot, because I wanted her to have spent her career as a woman in a man's world. If you're an Annapolis grad, I'm thinking the all-male environment began even earlier than when you started flight training. Also, I'm going to clip out your answer as to how many novels you wrote before getting published and show it to my students next time I'm teaching a seminar. There's such a prevalent idea among aspiring writers that the big end game is having finished one's first manuscript, and having done that, all one's effort should go into getting it published - online, if not professionally. No, no, no. So many authors need to do the whole novel-writing process several times in order to get good. I love to hear about authors who followed the patient path - and were rewarded with a publishing contract from Forge! Congrats. Julia, yes, my introduction into the mostly-male environment did indeed begin at the Naval Academy. I graduated in 1989, and at the time, women comprised less than 10% of the class. We were the 10th graduating class of women from the Academy, so we numbered far fewer than the women today. I think women comprise upwards of 22% to 23% of the class now. Something like that. And yes. The patient path to publishing. That was hard but necessary. Now, looking back at my first novel, had I tried to publish that, it would have been a huge mistake. A jumping of the gun on so many levels. So happy to know you would like to read HOVER. Will be curious to hear what you think, especially since you've written about a woman who was an ex-Army pilot! Thank you, BJ. I hope you do indeed find it interesting. Thanks for the comment! I am envious, Anne! When I was in junior high (in the sixties) I looked into joining the military when I was older. Women's jobs were nurses and glorified secretaries. That was it. So I said no thank you. My son was in the 3/7th Cavalry as a scout when the invasion of Iraq started, Crazy Horse company. One company of scouts was helicopter pilots, of which at least one was a woman. He had nothing but good things to say about them. I look forward to reading your book. I especially enjoy the story when I know the author has had similar experiences and knows what he/she is writing about. OK, Anne, on the scale of 1-10, with 10 being the highest, your impression factor is shooting straight past the 10. What an amazing life! And, what a great role model for girls who are dreaming those dreams of doing whatever they want as a career. I'm sure you've been told before that you are a pioneer for women. And, now you're writing novels, which will reach so many and serve as encouragement. Speaking of helicopters, my husband who got called to active duty from the Reserves Army in 2002, was in Afghanistan with Central Command for six months, ending in January 2008. For his birthday on Dec. 30, 2007, he hitched a ride on a helicopter going from Bagram Air Base to Camp Salerno and back. He said they called it the Circle. On the way back, they were joined up by three other helicopters carrying Taliban prisoners. When he told me what he'd done, I replied that he was crazy and thanked him for not telling me about it beforehand. He did say he got to see some beautiful country, but gee, I don't have to tell you about the danger. Your book sounds fascinating, Anne, and it's going on my TBR list today. Thank you for your service and sharing some of it with us today. You are certainly an expert about which you write. Pat, I feel extremely fortunate to have been afforded the opportunity to serve in an operational position in the navy. I can certainly understand why you said no thank you at the time. Thank you for sharing the story of your son. I'm glad he had a good experience - it sounds like he did, in general - but also with the women he served with. Unfortunately, all you ever hear in the media about women in the military is negative. Someone has been harassed, assaulted, raped, what have you. And yet, the vast majority of women are out there doing their jobs, day after day, working alongside their male counterparts without issue. Now, I'm not saying there isn't a problem with sexual assault in the services, but there are more stories out there to tell about women than just those. Anyway, I'm just glad he had good things to say. Thanks in advance for reading my book. And like I mentioned in the article, many scenes in the book mirror my own experiences, so I think - hope! - you'll enjoy that. Kathy, thank you for the nice words. I love the story about your husband. Yeah, that sounded like an "interesting" flight. Even now, when I tell my parents sea stories, they cringe, and thank me for not having told them at the time! Thanks for adding HOVER to your TBR list. I appreciate that and hope you enjoy it! Wow, Anne,I saw the photos of your signing at Poisoned Pen--I don't think I've seen a more well-attended event there! Are you on tour? Where can people find you in person? I do love the cover! As Hank said, it tells the kind of story I've been waiting a long time to read about. I lived at China Lake, where my husband worked, for over 20 years and remember many discussions and celebrations at the Barefoot Bar regarding women's advancement. When I lived there it was a great sorting out period for gender issues related to women. And I am very glad to hear about, well definitely read, your book. Congratulations on your new, and very exciting, writing career. Hank, my debut launch at the Poisoned Pen exceeded all my expectations, and then some. Barbara Peters, the owner - I'm sure you know her - said we had over 150 people in attendance and they sold over 100 books that night. I was blown away. Emily Mullen, my publicist at Forge - you probably know her, too - is arranging an East Coast tour, as we speak. Hopefully, I'l have the details next week. But they were looking at book events in CT, MD, and VA, last I heard. The tour (or they might do two mini tours) would take place in late July, early August. I'll be sure to let you know, of course. In the meantime, I am doing a radio tour. This has been fun. Not sure if you can post links here, but I do have a link to an interview I did on NPR's Here and Now with Steve Goldstein at KJZZ, a Phoenix affiliate station of NPR. Reine, you lived in China Lake!!! I was stationed at Naval Air Station Fallon, NV. We did search and rescue there and the squadron at China Lake was one of our sister squadrons! Flying search and rescue was out-of-this-world fun - risky as hell, because we flew high altitude, technical mountain rescue--but fun, just the same. I can certainly relate to the sorting-out-of-gender-issues. When I graduated, women were not allowed to serve aboard combatant ships, fly tactical aircraft, or serve aboard submarines. You can imagine, enduring the sweat and tears to get through the Naval Academy, but then approaching graduation, knowing you don't have the same choices as the men for where you'd like to serve. Frustrating, definitely. So glad you are excited to read the book! Congratulations, Sara. I explored the problem of being a woman in a man's environment in my first novel (about a woman judge in outer space), because when I first began to practice law, women constituted about 1% of the profession, and usually practiced in their husbands' or fathers' firms. A woman on her own had a lot of adjusting to do, because the men weren't going to. The law now seems to be fully integrated. Perhaps someday the military will be as well. Best wishes on the books. Oh, wonderful, Anne! Yes, post the radio links in the comments...people can always cut and paste! And if your east coast tour brings you to Boston..hurray! Make sure you let me know instantly! Anne, yes! I did live in China Lake!!! And guess what! My mother-in-law was a physicist there and volunteered with search and rescue!!! My brother-in-law was a physicist there, as well. My husband was an aero-engineer. What an incredible service! I love that you're writing! Thank you, Ellen. Yes, I hope the military can be fully integrated someday, as well. I think we're on the right track, just a long way to go still. Thanks for reading and also for your good wishes! I will let you know immediately if I'm headed to Boston. That would be AWESOME. Okay, so Reine, you're going to love this. My second novel is going to publish next summer and guess where it's set? NAS Fallon. It's about a female navy helicopter pilot who flies search and rescue. The love interest is a mountain guide this time. I used my experiences flying search and rescue, obviously, to write this book. Lots of action, but different from the action you'll find in HOVER. In the search and rescue book, it's stranded ice climbers, crevasse rescue, flooding, and the like. I think you'll like this one! Anne, sorry to be so late chiming in! It was my birthday today and I was doing birthday-ish things. I've heard fabulous things about your book! It sounds terrific and is going on my to-read list today. So glad your husband nudged you to write about your experiences! Right, Anne! I will love the search and rescue aspect possibly more than any other. The Southern Sierra has claimed a lot of pilots. My husband lost a friend who crashed his small plane that was sucked down going west from China Lake toward the Kern Canyon side. I used to love to watch the student rock climbers over at Robbers Roost, but that's where my personal interest stopped, unless you count backpacking! I enjoyed that, especially up Olancha and further north. So wonderful to have you here today, Anne! Congratulations on your mad success..and we cannot wait for book two! And the winner of HOVER is Rhonda Lane! YAY! Email me at h hryan at whdh dot com with your address! Reine, glad you were able to take advantage of the backpacking. No better place! Congratulations, Rhonda, on winning a copy of HOVER! And Hank, thank you, thank you, thank you for having me on the Jungle Reds blog today. This has been a lot of fun. You have a welcoming and wonderful group! Loved the post and comments about your amazing experiences. I can't wait to read HOVER! Also, this is the best phrase I've read all week: "...certain services were indeed rendered..."
Thanks, Rosemarie! Appreciate the good wishes! I loved this book!!!! Action, suspense, romance, women in the military at sea...the angst of being a "First " and being one of the few women in a sea of men... This book fascinated me on numerous levels, kept me up at night, and made me proud of women who serve at sea. I can't wait for a sequel! To whoever wrote the above review to HOVER, thank you!!! I can't tell you how wonderful it is to hear this! Yes, I do hope to do the sequel to HOVER. In fact, I have it written. However, first, there will be another novel - this time about search and rescue - that will release in June 2016. Thank you for reading and for your wonderful comments!